» Home » 2019 » February » 07 » What is Storm the Wall? What is Storm the Wall? Not many people can say they’ve done a triathlon in their life. 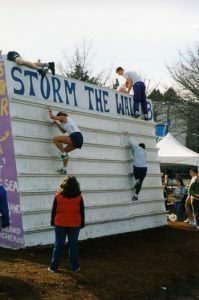 Although, if you’ve ever participated in UBC’s Storm the Wall, you’re not too far off. 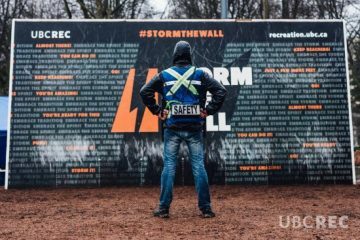 As the biggest intramural event in North America, Storm the Wall combines the three essential elements of triathlon with an extra twist: swimming, sprinting, biking and running– but at the end of the relay race, a 12-foot wall awaits. Teams work together to send each member over the wall- with 1-2 acting as bases and 1-2 reaching down from the top. At this event, there is a race-style for everyone depending on your personal preference. Just-for-fun and competitive involve teams of five completing a leg of the race separately before meeting to storm the wall together. On the other hand, Iron people complete all legs of the race on their own and can choose to storm the wall with or without assistance. Regardless of the race category you choose, fun is guaranteed, with the only differences being the intensity, the length of race and how you’ll get over the wall. This year is the 41st anniversary of Storm the Wall which was created by Nestor Korchinsky, the former Director of Intramural Sports. Korchinsky believed that the soul of a university was the combination of a school’s character and personality which came from its academics and extracurricular activities. In order to promote social cohesion amongst students, Korchinsky initiated this recreational sporting event based on scaling a wall which signified the obstacles one overcomes. 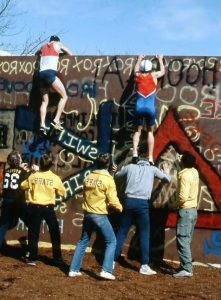 Every year since 1978, Storm the Wall has been a school tradition held during midterm season. Only three years after the event was created, the wall was infamously burned down in the middle of the night by students. Due to this incident, it’s tradition for Intramural Staff to guard the wall 24/7 during the four day event. This legendary event has also grown from 355 teams participating back in 2000 to over 800 teams registering in 2015. This year the goal is to have 900 teams Storm the Wall- our BIGGEST Storm to date. Students spanning from different years and faculties gather to witness their peers courageously storming the wall. An epic part of Storm the Wall is always the wildly creative team names. Throwing it back to 2000, a couple documented favourites were Grannies on Speed and Faster than Molasses. Some recent favourites include Student Debt, Wall. I. Am, Hips Don’t Lie and We’re Over It. Besides entertaining team names, last year’s highlight was Santa Ono making history as the first ever UBC President to Storm the Wall. In an interview with Thunderbird, Ono had this to say-“ … over the years, I’m going to do every single part of Storm the Wall. I don’t know if I’ll go to Iron Person, but I’m looking forward to it”. So is 2019 the year for Iron Person, Santa? Storm the Wall will be held this year from Sunday, March 24 to Wednesday, March 27. If you want to participate in a historical event that defines the soul of UBC, don’t forget to register your team by March 16.